Is this even the same road? 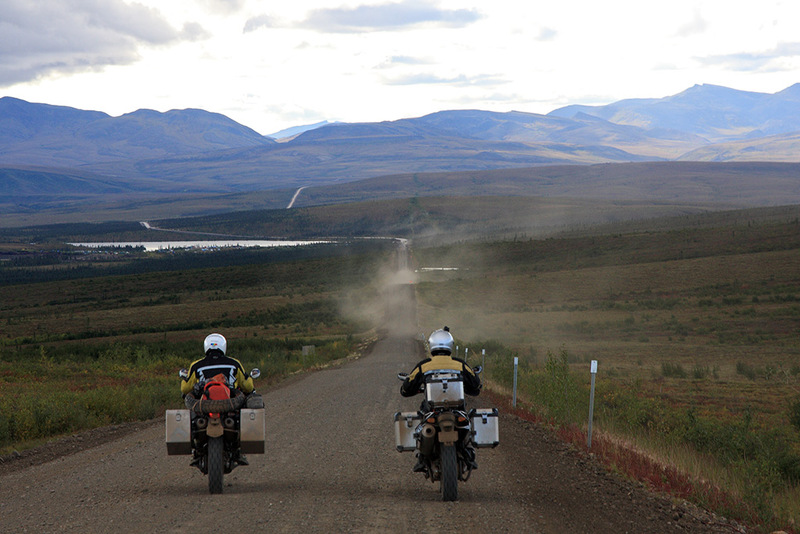 I know the sign fading into our rearview mirrors says “Welcome to Inuvik”, but the Dempster Highway is transformed. Four days ago the infamously challenging adventure highway tossed us around like Cerberus using three souls as chew toys, today what was once the Mud-Beast is now asleep in the sun. There are slightly blank looks, because passing through the same section now the surface is cement hard and fast going despite the construction vehicles littering it willy-nilly. “Keep to the left,” the flag person says, well not if you want a head-on with a dump truck or grater. The Dempster’s transformation isn’t down to the construction crew’s efforts, but the weather. Beyond vast open spaces and hospitality that big cities don’t even know enough to dream of, the defining element of the highway is weather. Whipped up in the Beaufort Sea and Arctic Ocean it flows down the Dempster, a vicious, fickle, transient, sucker-punching, and surly trickster god. 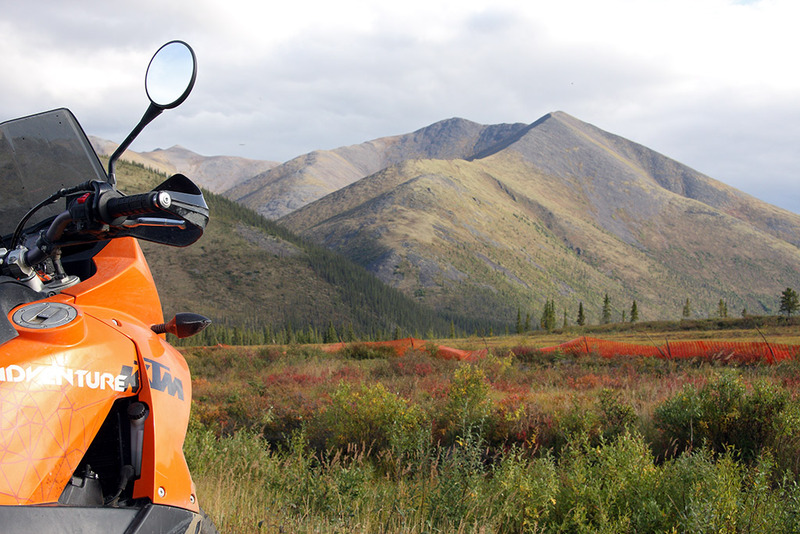 The Dempster is the only all-weather road in Canada to cross the Arctic Circle, and all weather is certainly what it needs to be. Forecasts in the North are subject to quick and rapid change. 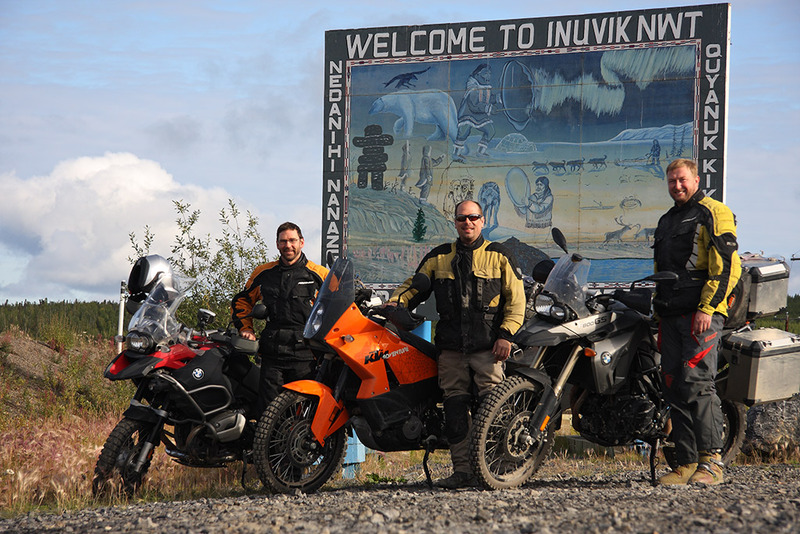 In our time waiting for brake pads to airfreight from Edmonton (the Dempster saw fit to eat the BMW F800GS’ and KTM 990 Adventure’s rear binders down to the metal), we take a flight to Tuktoyaktuk for a chance to play tourist and dip our feet in the Arctic Ocean. It’s a bright and sunny day as we descend into an “ice house”, a multi-room communal refrigerator using a resource the north has in spades – cold. In this case it’s in the form of permafrost found a maximum of two meters below the surface, our guide Elaine makes the point that even in summer here they need to use jackhammers to dig graves. Twenty minutes later we climb up through the cake-layers of sand and 10,000-year-old ice to find a bleak fog has charged in from the Arctic Ocean. In fog that covers the top of 70 meter high pingos, mound shaped hills formed by a process similar to frost-heaves, we hear our plane circling for a landing, once, twice, then fading into the distance. We are stranded in Tuk for two more hours, until our plane can land, slimming fog layer’s ceiling is on the way in. The flight is exciting, the five-seater late-60’s vintage Cessna’s altimeter never reading more than 700ft above sea level, and winds batting the small plane around like a cat with a mouse. We skim the tundra in an “Oh, look, swans… so close you can pat them” sort of way. 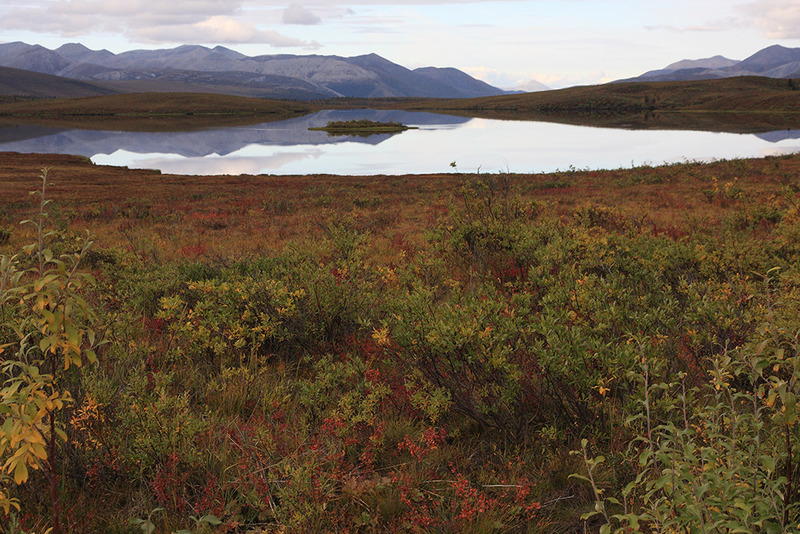 If there is a way to see the NWT with its multitude of two swan mosquito-hole lakes, this is it, though perhaps without the rollercoaster ride of turbulence. 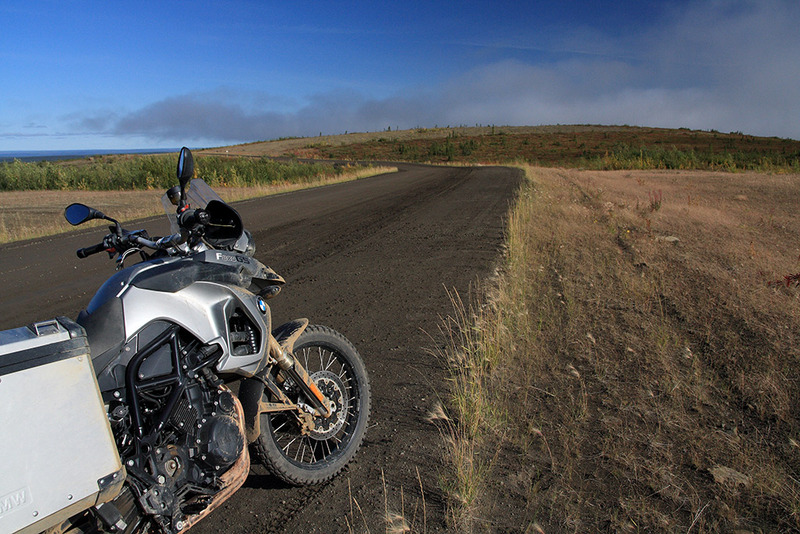 Sometimes though the elements are kind, and as we turn our backs on the end of the road and ride south from Inuvik towards the Arctic Circle, predictions are for sun, and high cloud. 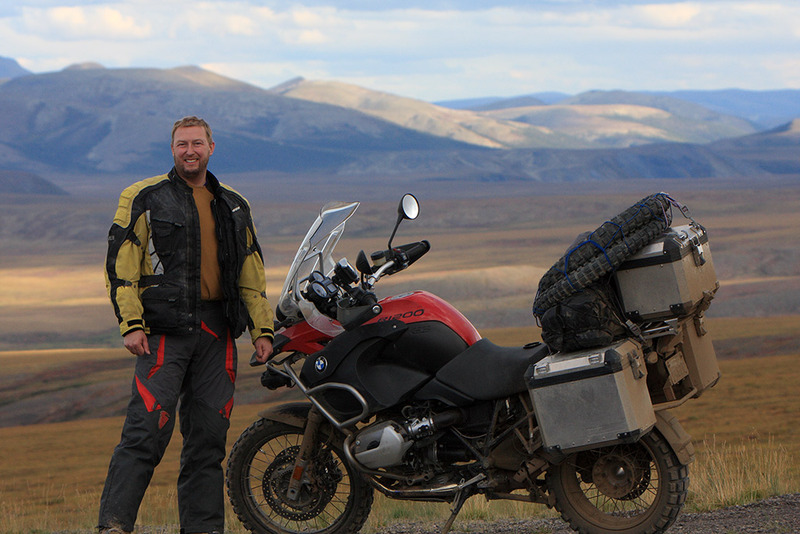 By the Northwest Territories’ border there are only hints of the traitorous, treacherous Mud-Beast and we’re hitting the Dempster at its scenic best. 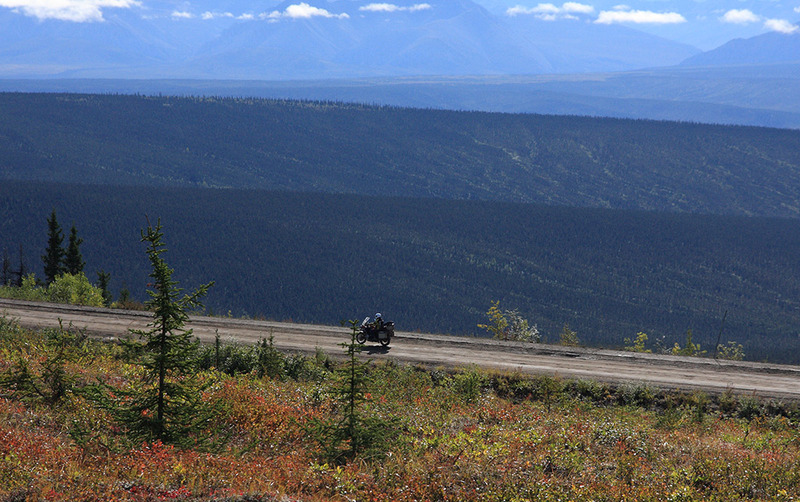 The highway is relaxed and resplendent in the sun, the four days of cold wet weather we’ve had in Inuvik pushing the foliage, shrubs and tundra into releasing fall splendor. Yellows, reds, oranges and golds dapple the landscape. Sunlight mottles the hills and valleys as we ride through moraine, glacier rounded mountains, and down passes so steep they feel like rollercoaster rides with just a little slick mud still at the bottom for extra edge. 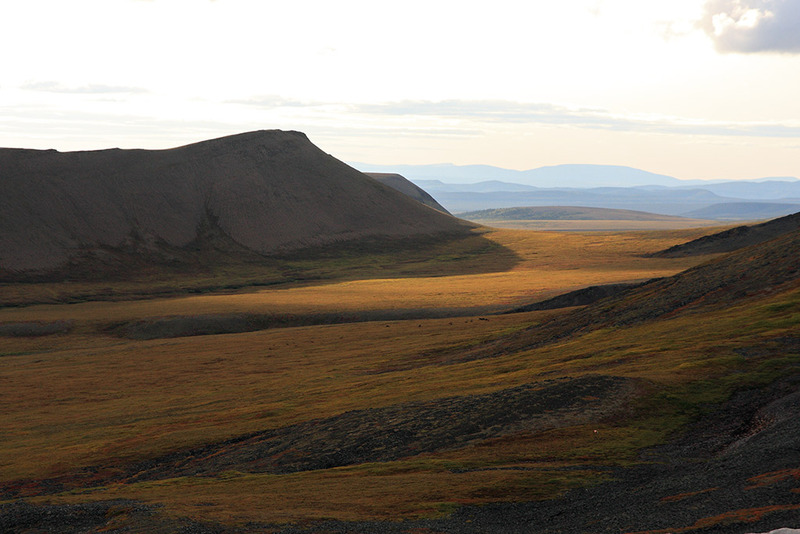 The Dempster, though, is showing us another face, one that is unfeasibly, jaw-droppingly beautiful and almost reason enough to put a road here. Herzog couldn’t hold his belief our century is “starving for great images” if he ever turned an eye or lens to this impressionistic landscape. 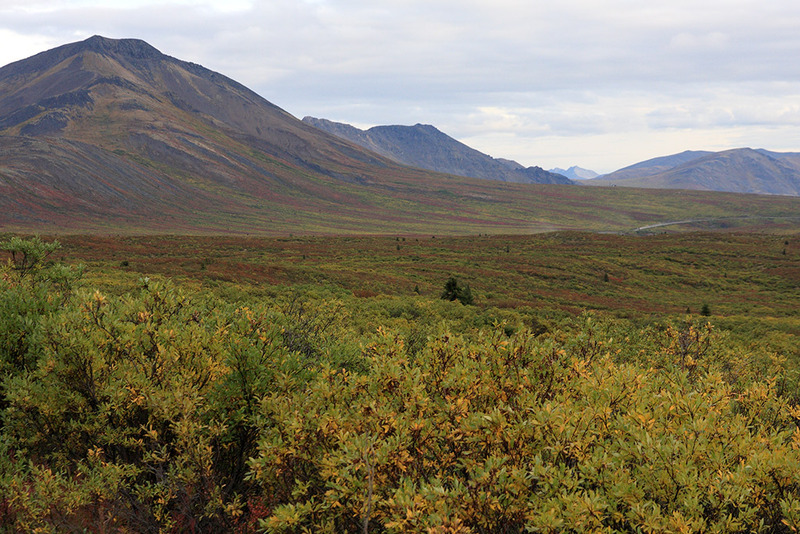 Words can’t do the spare variegated landscape justice, pictures make a good effort (explaining the enormous gallery for this post), but ultimately the Dempster in August’s growing autumn is a sight to be seen for yourself. Sparse doesn’t mean unpopulated though. Small lakes play host to a set of trumpeter swans apiece. 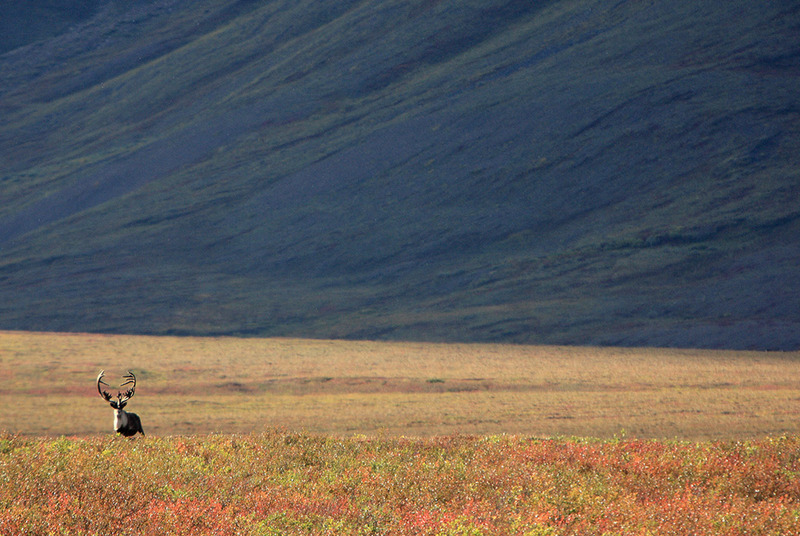 North of the NWT border there are Caribou grazing on the tundra and looking distantly delicious. Blasting southwards towards the Arctic Circle, a four-by-four driver waves us down, “Grizzly!” she says pointing. 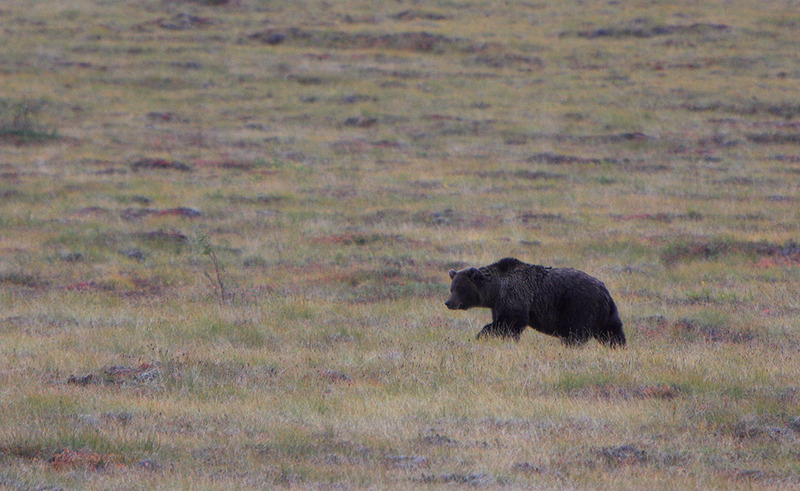 Three hundred meters off the road, there is a brown mass shuffling through the tundra. Then with the nonchalance only an apex predator can muster, it slowly begins to saunter towards the truck, closing the distance on a diagonal. 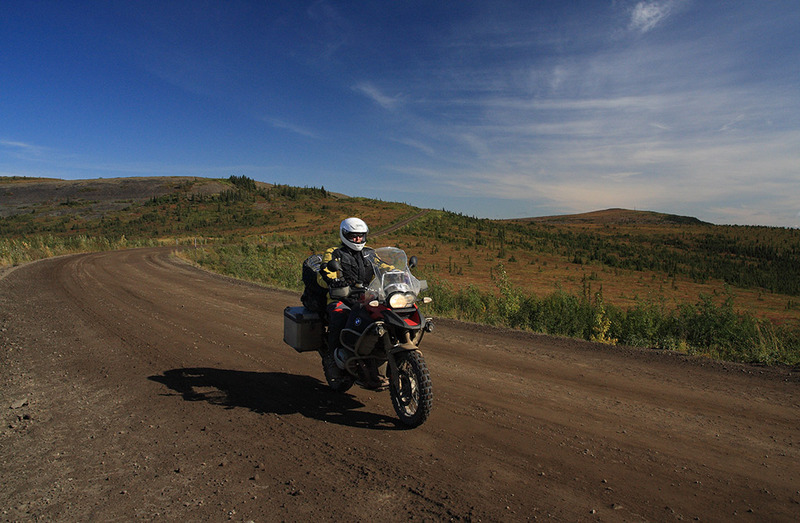 The truck moves off, leaving Glenn on the BMW R1200GS Adventure and myself on the F800GS well and truly exposed. Watching something the size of a Volkswagen Beatle, composed primarily of fur, fangs, claws and appetite, come toward you kicks in thousands of years of evolution, ensuring we are clear on the entire matter of “fight or flight” response. We’ve been reminded that here we’re not at the pointy end of the food chain, and leave the engines running. Outside our hotel at Eagle Plains, the day’s light is long, golden and low. A wildfire burn of Lodgepole Pine looks like a decimated Dr. Seuss forest, it’s humorous and poignant all at once. The trees’ vertical shadows jail that of the F800GS and my own to the road’s edge. 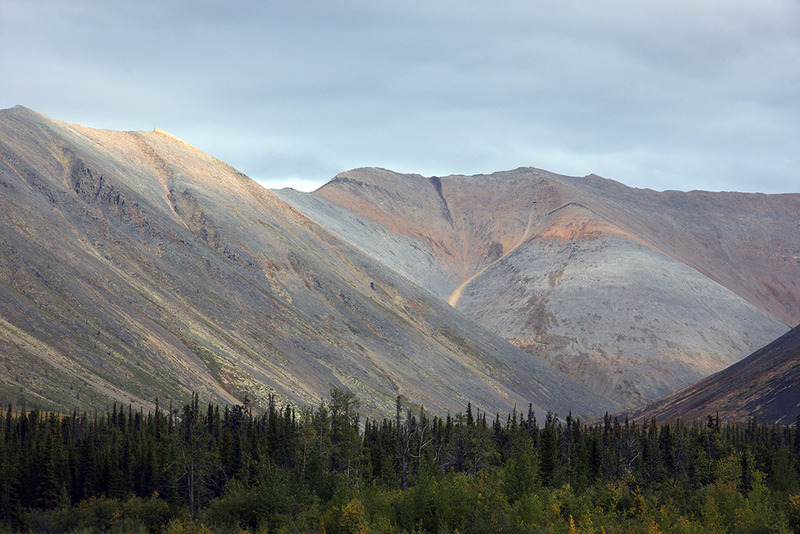 It’s a portent; the Dempster has captured us and is intent on showing all its facets. 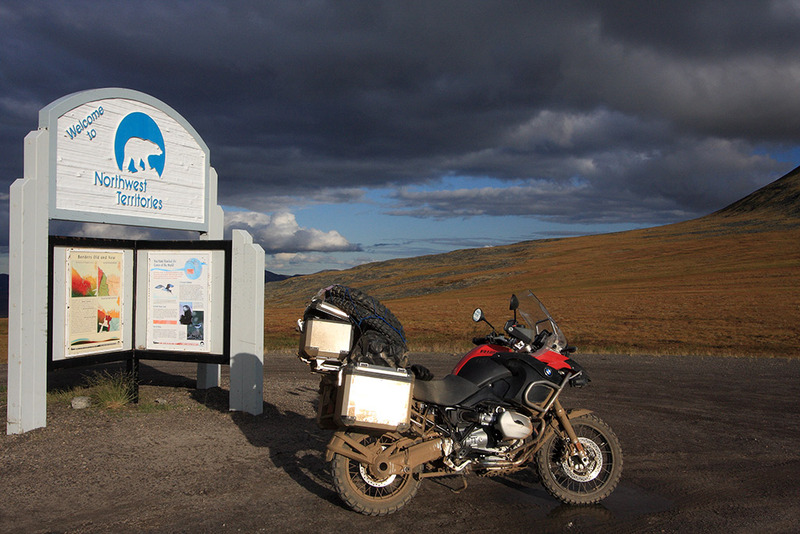 The night is clear and brisk, and the morning likewise when we wake at this outpost, 370km from anywhere. 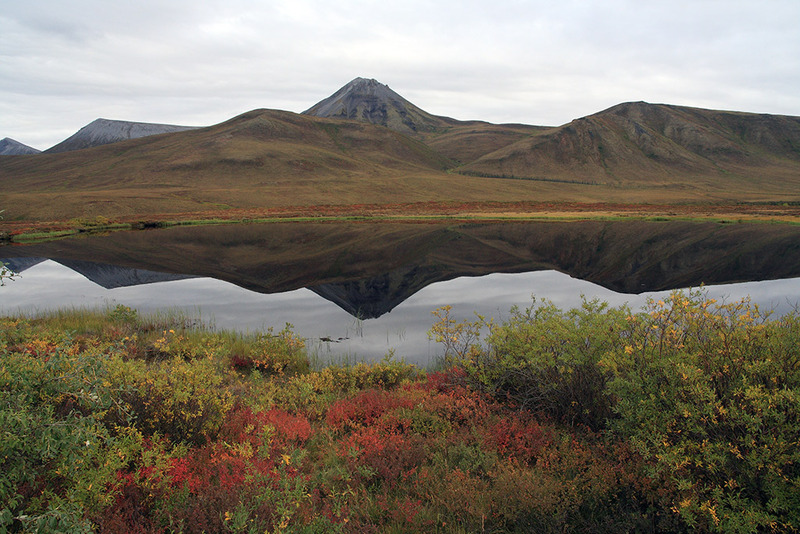 The night has pushed the Dempster that much further into fall, pushing the colours of the shrubs and tundra to oil paint saturation. We’re riding through the Olgilvie Range, rounded by glaciation with occasional jutting dolomite protrusions called tors giving the range its fangs. 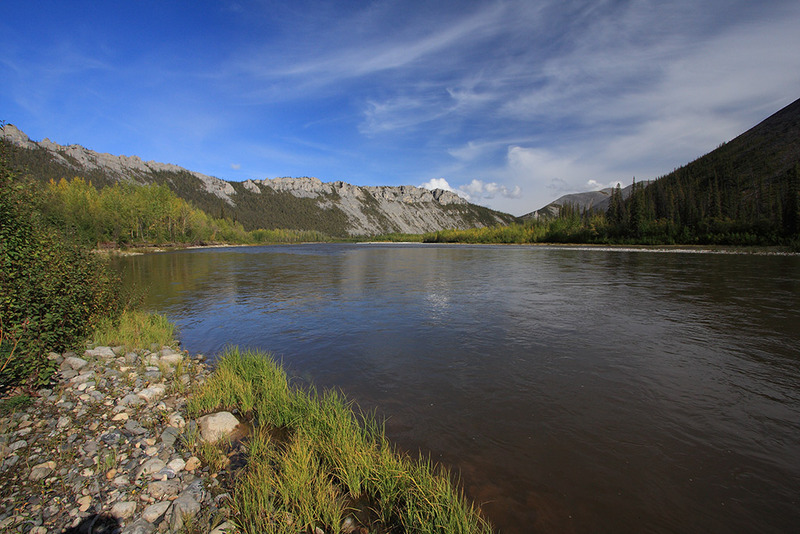 Then past Red Creek and Sulfur Springs, the rotten egg odour is as unmistakable as the light-red iron-infused water, which has stained everything with its ferrous touch. At Two Moose Lake, a five-year-old bull shyly waits to cross the road and join three cohorts in the lake – so “Two Moose Lake” is more “A Few Moose Lake”. 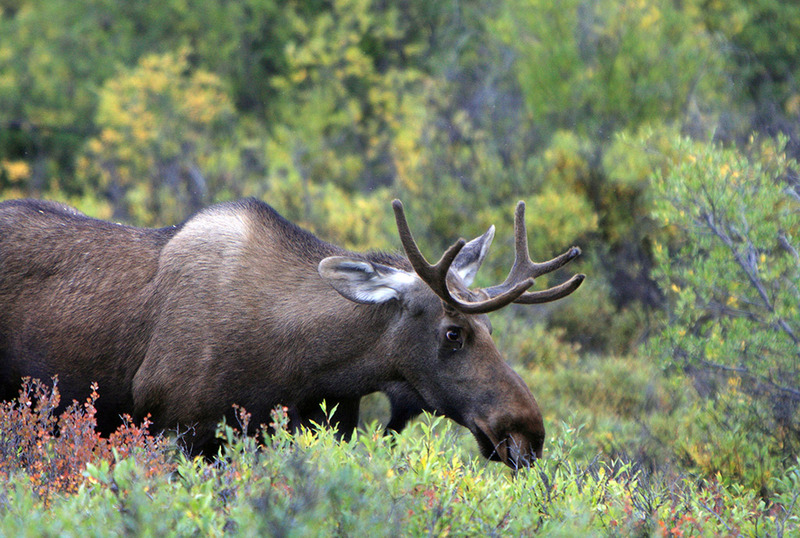 We’re not big game experts, but later, in Dawson, Glenn spots a poster indicating the age of a moose based on the size of its rack (of the antler variety). There’s a sense of relief to discover our moose isn’t mature enough for “harvest”, a colloquialism for hunting throughout the Yukon and NWT. I’ve rules about eating creatures I’ve met socially, even if they are delicious as proven by a dinner with new friends Peter and Sue back in Inuvik. 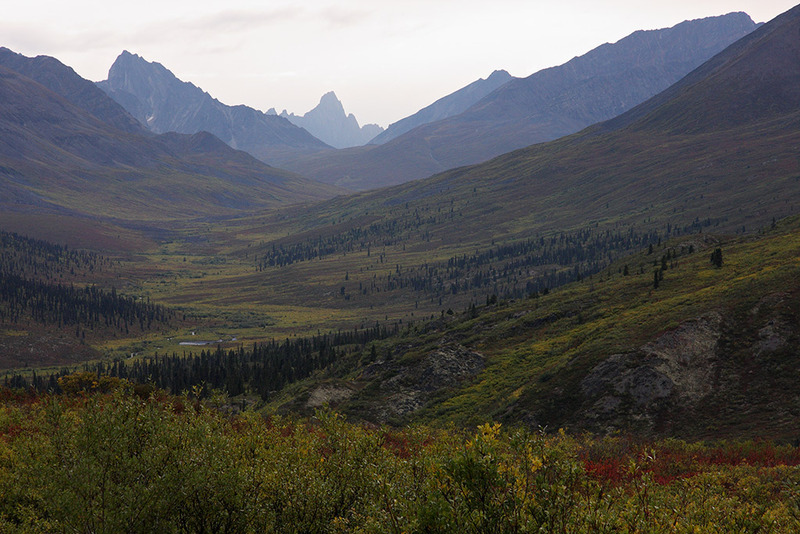 Eventually we leave the moose be, unarmed and uneducated in the ways of wild game, our stomachs are dictating that we should reach Dawson by nightfall for a solid meal and a comfortable stay at the Downtown Hotel. 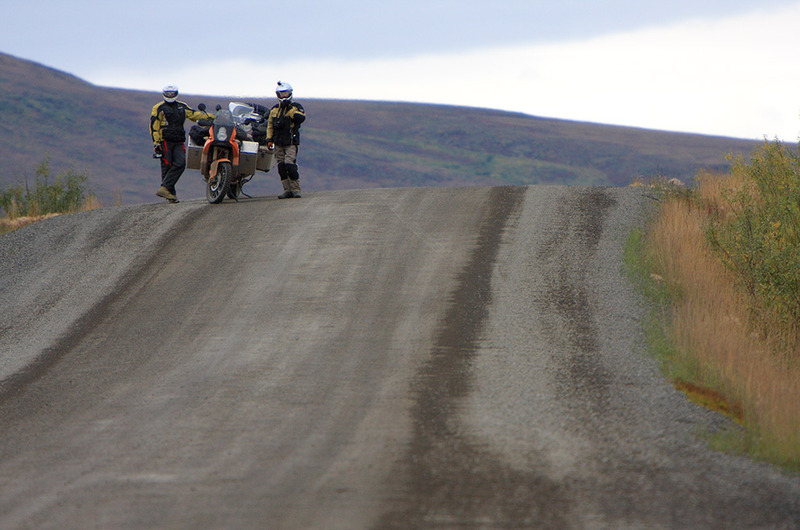 The pace is brisk and sees both the KTM 990 Adventure and the BMW F800GS run out of fuel, making undoing and reattaching the gas can the ride’s major challenge – beyond making progress in the face of 100,000 photo ops. 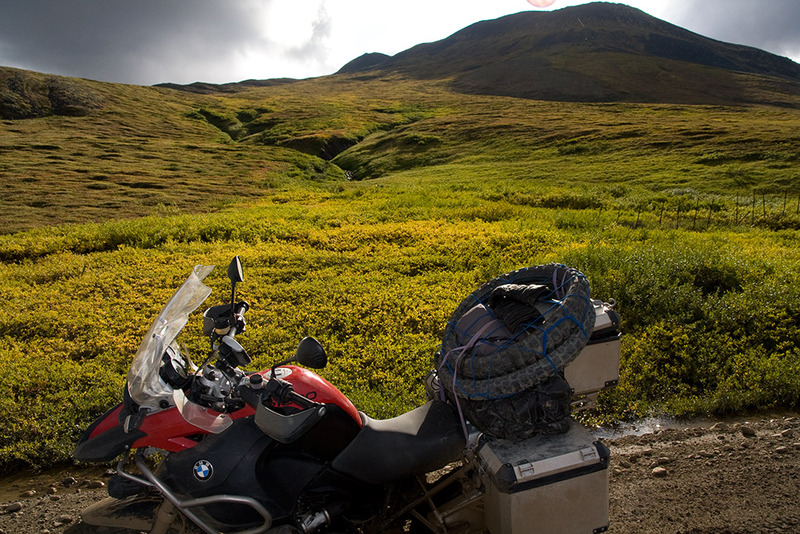 It’s not all light and beauty, the F800GS takes a rock to the headlight cracking the glass and the R1200GS Adventures rear fender is snapped free, proving even on a good day the Dempster has some teeth. 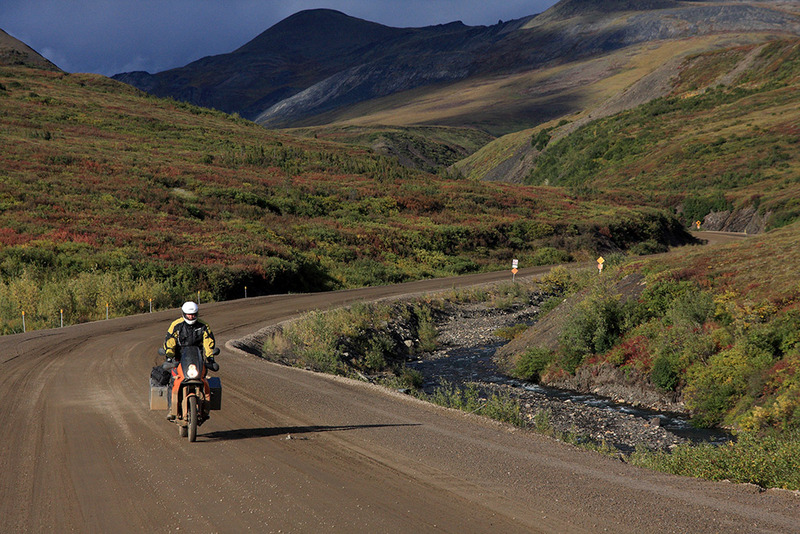 There is a sense of elation at reaching the junction of the Alaska and Dempster Highways. 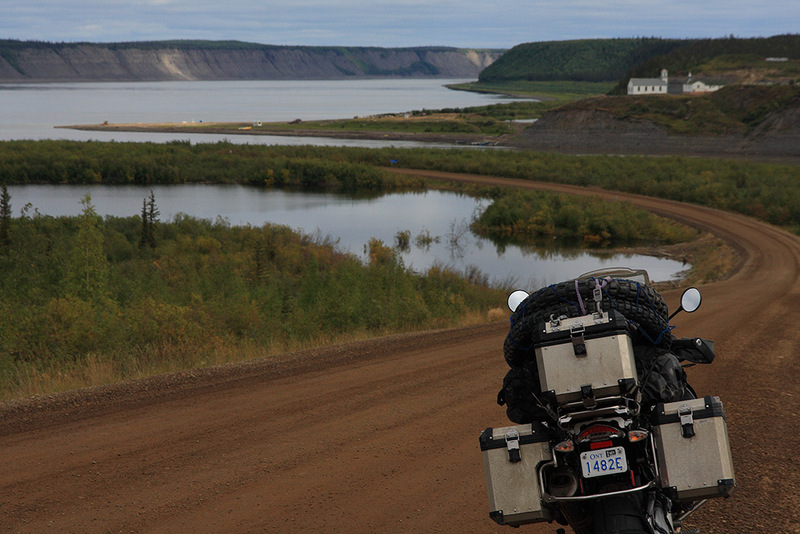 We’ve seen three aspects of the Dempster, from dormant to demon to delight, each a less than subtle hint that you could ride this road a 1000 times and never have the same adventure. A great series of images both pictorial and verbal. I met you three in Bell II on your way south from your trip along the “mud-beast”. I was one of the KLR 650 riders that spoke to you. I enjoyed talking to you and really like your Dempster story – great writing! Great to hear from you! How was the rest of your ride? Just a quick note to let you know how much I LOVED the photos and article – you sure can write! Thanks! Much appreciated. The boys knocked themselves out on the shots didn’t they!